Roald Dahl is one of my favorite authors and has been since I was a child. Between my childhood, teaching first grade, and reading to my own children, I think I’ve read almost every one of his books. Roald Dahl’s use of language and the way he played with words is tremendous! One Back to School Night a parent asked what my least favorite word was (my answer was two words, “I can’t”) and then asked what my favorite word was, very quickly I replied, “scrumdiddlyumptious.” Actually quite fitting in retrospect as I now have a food blog! Here Roald Dahl asks us to continue to look at the world with childlike wonder. 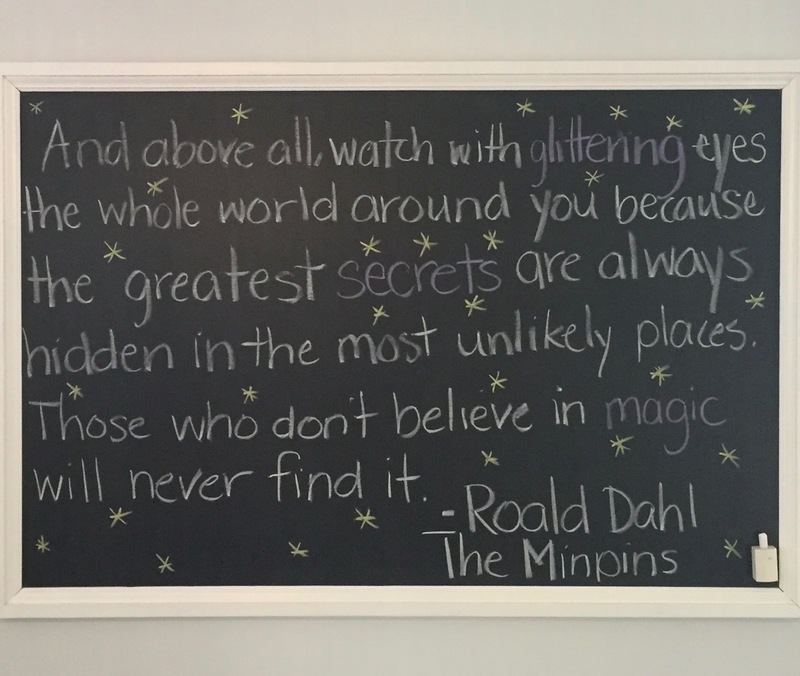 Keep an open mind, and your “glittering eyes” can find magic in the most unlikely places. Beauty is all around us, though sometimes we need to look a little more carefully to find it. This quote is from his last book, The Minpins, and is the last line in the story. I would like to thank Natascha over at Natascha’s Palace for nominating me for the 3 Day Quote Challenge. Natascha is an elementary school teacher, a Canadian ex-pat in Spain, and an incredible home cook. Her blog is full of delicious food and lovely anecdotes about her life in Spain. Thank you, Natascha for thinking of me! Share one new quote on three consecutive days on your blog. They can be from anywhere, anyone, or anything. On each of the three days, nominate three more bloggers to carry on with the fun! No pressure; nominees are free to decline. I absolutely love his understanding of childhood, and especially the grown ups and all the other players in it. Thank you, Lynne! Hard to pick just one Dahl quote. Again I love the chalkboard and the quote! yes I have one hanging above our counter, I love it! I have been a first edition book collector (and seller for a short while) for many years. ‘Twas a sad day when I let go of and sold my first edition Roald Dahl “James and the Giant Peach.” He was a wonderful and inspirational writer! That must have been so tough! I love old books and imagining all the different people who turned their pages throughout the years. Love the last sentence of this quote! That’s what every child should be taught … every day. Completely agree, Francesca! Teach the children and remind the adults! Great quote. 🙂 Roald Dahl was a wonderful writer. Not many of us could ever find fault with Roald Dahl. I can’t say I’ve read all his books, but I’ve read quite a few. This is a great quote to finish your challenge on, and a thought-provoking one, too. The idea of watching the world with ‘glittering eyes’ is just perfect. An open mind is essential if we want to find goodness and beauty around us.